Anomaly of the mean monthly Antarctic sea ice area for months February and March relative to the period 1992-2001. Like in left image but for the Arctic. Daily Antarctic sea ice area of the last 6 months in relation to the mean daily sea ice area and its variability for 1992-2001. Like in left image but for the Arctic. 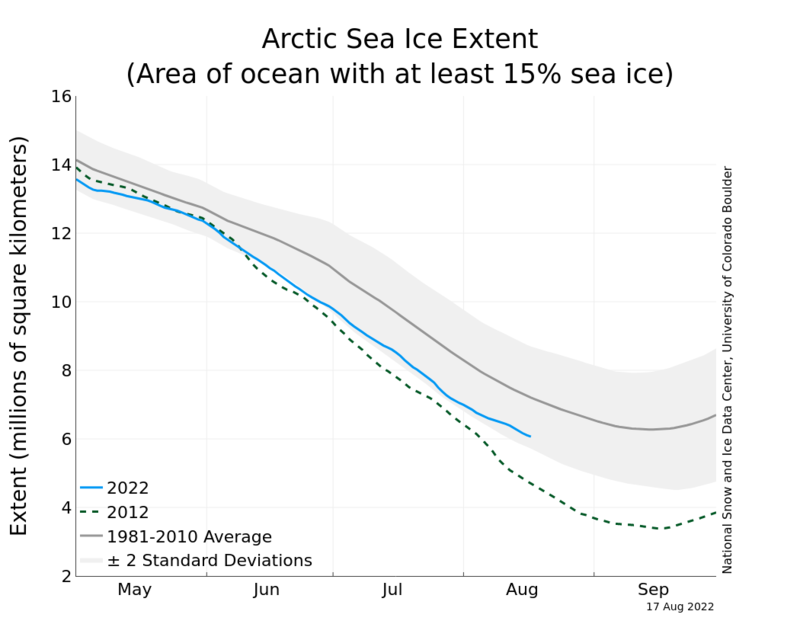 This data are based on sea ice concentrations calculated with the ASI algorithm (www.seaice.de). Map of the Arctic sea-ice concentration anomaly of the recent month relative to the 1992-2018 climatology. Black (grey) isolines mark 15 % sea-ice concentration of the recent months' mean (of the climatology). Like above but for t he Antarctic. Both maps are available on request as netCDF files. The sea ice concentration or sea ice area fraction is the main parameter describing the sea ice cover. It is usually given in % and is the percentage fraction of a known area (e.g. a grid cell) covered by sea ice. University of Hamburg - ASI algorithm sea-ice concentrations from AMSR-E and from SSM/I-SSMIS. Visualisation of the ASI-algorithm sea-ice concentration time series (by Niklas Röber, DKRZ). We note that ASI sea ice concentration data are merely based on data of the near 90 GHz channels of SSM/I, SSMIS, AMSR-E, and AMSR2. The finer spatial resolution achieved by doing so, occasionally comes at the expense of the accuracy of the product. One the one hand, spurious or unrealistically high sea ice concentrations could occur over the open water and in the marginal ice zone due to an uncorrected weather influence. On the other hand, over high ice concentration areas unrealistically low sea ice concentrations could occur. These could be caused by changes in the physical properties of the sea ice and the snow on top of the ice due to varying weather conditions. Between March and April 2016 sea ice concentration processing was switched from DMSP-f17 to DMSP-f18. Preliminary investigations show that Arctic sea ice area might be 1-2% lower, Antarctic sea ice area about 1% higher for DMSP-f18 than for DMSP-17. Common parameters describing the sea ice cover are also the total sea ice extent and area (in km²) covered by sea ice. Examples or the actual development of these parameters are given at the top right of this web page and further down at the right hand side. The sea ice cover has been retrieved using satellite observations for over 30 years now. The actual development of the sea ice cover can be seen in the monthly sea-ice concentration anomalies relative to 1992-2018 in the top right based on ASI algorithm SSM/I - SSMIS sea ice concentration data. 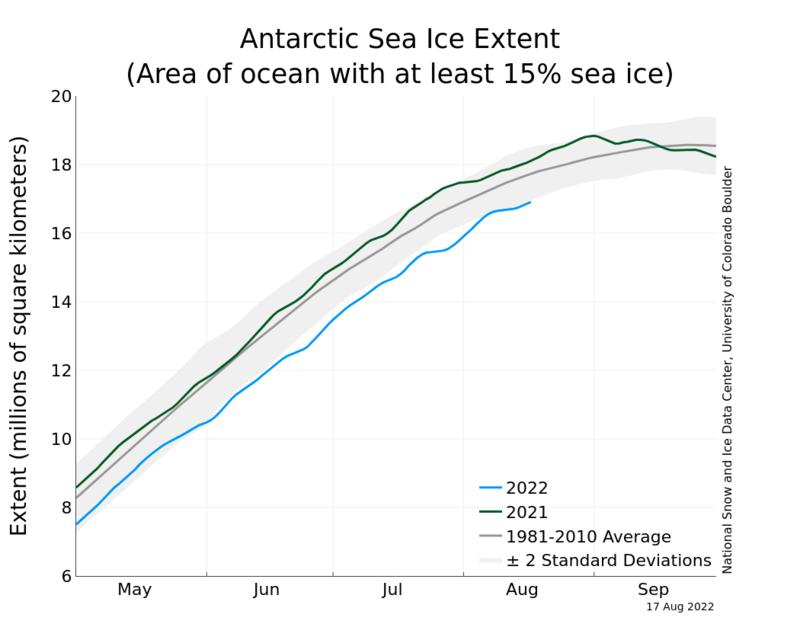 Animations of the anomalies for the period 201201-201903 are shown here for the Arctic and the Antarctic. Note that we display NEGATIVE sea ice anomalies in red because these correspond to POSITIVE temperature anomalies and vice versa for positive sea ice anomalies which are given in blue. The black (grey) line denotes the actual (climatological) position of the 15% ice concentration isoline for the respective month for the reference period 1992-2018. Sea ice drift is the displacement of sea ice (either single floes in case of buoy observations, or of certain areas in case of satellite observation) within a certain time period. Typical units are km/day and cm/s, or start and end co-ordinate of a drift (or displacement) vector. Satellite remote sensing has led to time series similarly long (25-30 years) as for the sea ice cover. Currently, the sea ice thickness is amongst the sea-ice parameters that are still very difficult to obtain over large areas; yet no sea ice thickness data time series exist, based on observations, which cover large areas over an entire seasonal cycle. Available data are based on satellite altimetry (sea ice thickness estimated from sea ice freeboard height, i.e. that sea ice part that looks above the water line), satellite radiometry (sea ice thickness estimated from physical relationship between ice thickness, salinity, temperature and emissivity), air-borne systems (provide ice+snow thickness), underwater observations (sea ice thickness estimated from sea ice draft, i.e. that sea ice part below the water line), and in-situ observations (ice cores). Unit is in meters. Backward running animation of the latest 20 polynya maps in the region "Western Ross Sea" derived with the PSSM algorithm from DMSP-f18 SSMIS observations. Backward running animation of the latest 20 polynya maps in the region "Central Weddell Sea" derived with the PSSM algorithm from DMSP-f18 SSMIS observations. Sea ice can be divided in different types, i.e. according to its age (multiyear ice, first-year ice, young ice), degree of deformation (level ice, rafted/ridged ice), or location (marginal ice zone, pack ice, fast ice, lead, polynya). These types are given in different units, i.e. as absolute or percentage area fraction (e.g. multiyear ice), or as probability of occurrence (e.g. polynyas). Picture of a melt pond distribution on Arctic sea ice taken aboard a helcopter during Polarstern expedition ARKXXII/2 during summer 2007 (Stefan Hendricks). During the summer melt period Arctic sea ice is covered by so-called melt ponds (see photography to the right). The fractional coverage of sea ice with melt ponds depends on initial snow depth, onset and duration of summer melt and ice type. Melt ponds appear dark compared to the surrounding sea ice. They absorb more solar radiation than the surrounding sea ice which accelerates sea ice melt (positive feedback). Sea ice underneath melt ponds is also thinner and allows more solar radiation to penetrate the sea ice and warm the water underneath. The earlier melt ponds develop in the season the more solar energy is available for sea ice melt. Melt pond identification or mapping using satellite data is still a challenge because of a) the small size of melt ponds and b) the quite persistent cloud cover during summer in the Arctic ocean. Using a combination of reflectances measured with different channels of the Moderate Resolution Spectroradiometers MODIS in a neural network allows to identify and map the fractional melt pond coverage on Arctic sea ice with weekly temporal resolution. Sea ice is typically covered by snow. A retrieval of its thickness is similarly complicated as the sea-ice thickness observation. Yet only few snow depth on sea ice data time series exist, based on observations, which cover larger areas and a full seasonal cycle. Snow depths are typically given in cm. One important quantity in the global hydrological cycle is the amount of water that is accumulated as snow on land. So, in addition to its impact on the surface heat and radiation budget (see snow cover) snow plays an important role for soil moisture, river run-off, and by this for water availability during and after snow melt. In-situ observations of snow depth and density, e.g. at routine observation stations of the World Meteorological Organization (WMO), have a high accuracy. However, such observations are not necessarily representative for a larger area, and the observational network is not very homogeneous. Satellite observations are thus a real alternative. Based on space-borne observations of the surface brightness temperature at two different frequencies in the microwave frequency range (usually at 19 GHz and 37 GHz), e.g. using Special Sensor Microwave / Imager (SSM/I) data, SWE can be determined via an empirical relationship. This has been done for the datasets provided here. Knowing the snow cover on land is essential for the correct estimation of the surface radiation budget. Snow reflects a larger part of the incident shortwave solar radiation back to space than most other natural surfaces like grass, trees, or water. At the same time snow according to its physical temperature emits as much long-wave (thermal) radiation as these other natural surfaces. Areas covered by snow exhibit a negative radiation balance therefore. Also, already a snow cover or a few centimeters thickness acts as a good isolator for the soil. It is therefore essential to know where snow can be found, or, more precisely, what the snow-covered area fraction of a specific region is. This area fraction can be estimated, e.g., using radiance differences measured with space-borne spectroradiometers such as MODIS - this can happen with more or less sophisticated automated routines or by trained analysts manually. The data portal at ENVEO: http://cryoportal.enveo.at provides near-realtime information about the daily snow cover in the pan-European area derived from optical and microwave satellite data. Land ice, to most known as glacier, is another important component of the Earth's climate system. Land ice exhibits a higher shortwave albedo than most land surfaces and/or vegetation, similarly to snow. Therefore, land ice also reflects quite a high portion of solar radiation. Consequently a land ice cover influences the local, regional and or even the global climate depending on its size. Additionally, land ice stores a large amount of fresh water; in some regions land ice (melt water) comprises the only reliable source of fresh water. Finally, retreat and advance of land ice area and/or volume is an indicator of air temperature changes or of changes in the hydrological cycle of that land ice cover (balance between accumulation and ablation), and thus land ice parameters can reflect climate variability and/or indicate climate change. A routine observation of land ice area, volume, and other parameters is therefore mandatory.